Push Me Out is a brand new prize machine that is suitable for both adults and children. The bright cabinet, featuring fun sound effects and colourful lighting is sure to customers to your location. Push Me Out features simple gameplay but is also a challenge - with repeat play great for revenue. The machine has both an anti-theft and anti-swing design and the prize drawers are adjustable to accept a variety of different prizes. 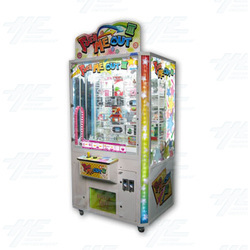 Push Me Out is a brand new prize machine that is suitable for both adults and children. The bright cabinet, featuring fun sound effects and colourful lighting is sure to customers to your location. Push Me Out features simple gameplay but is also a challenge - with repeat play great for revenue. The machine has both an anti-theft and anti-swing design and the prize drawers are adjustable to accept a variety of different prizes.